Parts separators are used for separating and sorting parts or components prior to presenting them to the appropriate feeder bowl or automation system. Parts separators can be a critical part of an automation system that needs to present multiple parts to the system. Parts separators can get complicated, but we have the experience to make it look easy and to make it function reliably for many years. Our parts separators are custom manufactured in-house. Medical and food grade steel is available. Put our 125 years of combined experience to work for you. 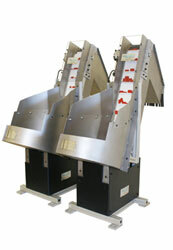 For further information or a free quote on parts separators, contact Dial-X Automated Equipment, Inc. Serving Alabama, Arizona, Arkansas, California, Colorado, Connecticut, Delaware, Florida, Georgia, Hawaii, Idaho, Illinois, Indiana, Iowa, Kansas, Kentucky, Louisiana, Maine, Maryland, Massachusetts, Michigan, Minnesota, Mississippi, Missouri, Montana, Nebraska, Nevada, New Hampshire, New Jersey, New Mexico, New York, North Carolina, North Dakota, Ohio, Oklahoma, Oregon, Pennsylvania, Rhode Island, South Carolina, South Dakota, Tennessee, Texas, Utah, Vermont, Virginia, Washington, West Virginia, Wisconsin, Wyoming, United States and Canada. © Copyright 2019 Dial-X Automated Equipment, Inc. All Rights Reserved.